Please accept my best wishes if you are planning a wedding. 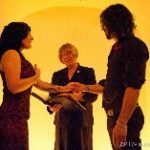 I am Mary Beaty, a certified Humanist Officiant licensed by the Registrar General and the Ontario Humanist Society to provide legal, non-denominational, non-sectarian, non-religious marriage ceremonies in Ontario. I also provide Humanist funeral and memorial services, baby-naming ceremonies, and other secular celebrations of life passage events. Humanist Ceremonies do not use religious language, but are respectful of cultural traditions and may include traditional as well as modern elements of your choice. Our marriage ceremonies are the same as a ‘civil’ wedding, as conducted by a Justice of the Peace, a Marriage Commissioner, or a ‘City Hall’ wedding, but each service is personally written, including Humanist values of equality and respect and commitment. 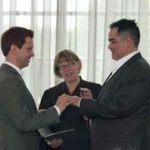 Note: Humanist officiants are listed as ‘religious officiants’ by Ontario Law, because there is no category for ‘ethical or humanist officiants’, but our ceremonies are not religious. 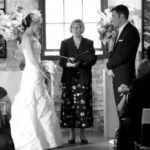 Whether you choose a traditional or contemporary wedding, a private elopement or simple legal ceremony (for those planning a destination wedding or another spiritual event) or a family or community wedding, each ceremony is prepared with the couple, to reflect your own values and wishes, traditions and style. Here are a few sample wedding ceremonies as a guide. We offer both traditional wedding services, formal and informal, and also modern contemporary ceremonies. Our services are simple and unfussy – but we encourage you to include traditions, music and personal touches, including friends, family, and humour! We also ensure that your wedding follows all the legal guidelines and requirements of the Marriage Act of Ontario. We officiate at all types of wedding ceremonies, from private ceremonies to small weddings for family and friends, to larger events. I have been a marriage officiant since 2004, and am honoured to have married over 1000 couples. 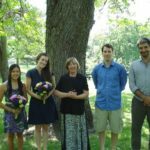 I am familiar with heritage traditions, inter-cultural weddings, non-traditional ceremonies and unique locations, as well as surprise weddings, private elopements, location weddings, weddings with children, and other special circumstances. About Me: I am a Humanist Chaplain at the University of Toronto, a librarian, a human rights and social justice activist, a teacher, grandmother, writer, and an original member of the Toronto School of Storytelling. As an organic gardener (and former sheep farmer) I am interested in sustainability, and green issues. I am a member of the The International Humanist and Ethical Union, The Humanist Association of Toronto, The Ontario Humanist Society, and the American Humanist Association (AHA). From 2001-2007, I represented the AHA at the United Nations in New York, and I am a founding member of the Council of Ethics Based Organizations (CEBO)at the United Nations. also, Metro Reference Library, The Royal Conservatory of Music, Royal Ontario Museum, Gardiner Museum, Arts and Letters Club, Art Gallery of Ontario, including the intimate Grange Library and Frank restaurant, University of Toronto, Hart House, & the Gallery Grill, Knox, Victoria College, Faculty Club, UofT MultiFaith Centre, also St. Lawrence Hall, and historic sites such as Todmorden Mills, Enoch Turner School House, Campbell House, Allan Gardens, Casa Loma, the Brickworks & Distillery, as well as the Gladstone, Park-Hyatt, Hilton, Sutton, Royal York, Drake, Le Germain, the George, Templar, Trump, King Eddy, Four Seasons, Windsor Arms and other Hotels. Also many cafes and small restaurants; from Balzac’s coffee house, to the Rectory Cafe on Toronto island (Star article), to Le Select, Globe Bistro, The George, Peter Pan Bistro, Cluny, Colborne Lane, Grace, The Cadillac Lounge, Il Fornello, 7 Numbers, Caffino, or your local bar & bistro. Just ask them if they can host a small informal wedding! We’ve held fun ceremonies in big and small museums and art galleries, clubs, bars, party rooms in condos, on your rooftop, in your living room or hotel room, at the gazebo at St. James, the Music Gallery, beaches and woodland walks, and in snazzy rented apartments and hotel suites. We’ve celebrated weddings in many unique spots, including castles, forests, boardwalks, the Rosedale bridge, in a rowboat on the lake, a deserted beach in November, a bright January morning in the Skypod of the CN Tower (right), or the ice rink at Nathan Phillips Square. Whether you choose a traditional, romantic or unusual setting, we help you design a simple, meaningful ceremony which reflects your values and traditions – because it’s YOUR wedding. I am available for weddings and ceremonies in most of Toronto, particularly downtown, and at other locations in Ontario by request. Just send me a message with your date & location, or send this enquiry form and I’ll be happy to answer questions, chat about your plans, and send sample ceremonies, wedding ideas, and a fee schedule. If I’m booked, I’ll refer you to other Humanist officiants, who will perform similar ceremonies. I am also licensed by the Humanist Society of the American Humanist Association and the State of New York to solemnize marriages in New York. I have officiated for many Canadian and international couples honeymooning in New York City, including a memorable dawn wedding on the Brooklyn Bridge on Canada Day. 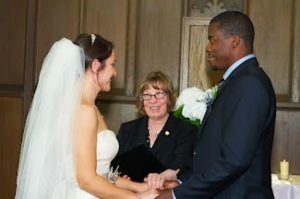 I am happy to arrange a NYC wedding or refer you to my colleagues in New York. Feel free to ask about legal requirements for Canadians wishing to be married in New York. See Weddingsofnewyork.com and ElopeNewYork.com for more information. We’ve been profiled in the New York Times, the NYDailyNews, ABC, Martha Stewart, Canal+, TimeOutNY, etc.